Conventional Subnet masking replaces the two-level IP addressing scheme with a more flexible three-level method. Since it lets network administrators assign IP addresses to hosts based on how they are connected in physical networks, subnetting is a real breakthrough for those maintaining large IP networks. It has its own weaknesses though, and still has room for improvement. The main weakness of conventional subnetting is in fact that the subnet ID represents only one additional hierarchical level in how IP addresses are interpreted and used for routing. It may seem greedy to look at subnetting and say what, only one additional level? J However, in large networks, the need to divide our entire network into only one level of subnetworks doesn't represent the best use of our IP address block. Furthermore, we have already seen that since the subnet ID is the same length throughout the network, we can have problems if we have subnetworks with very different numbers of hosts on themthe subnet ID must be chosen based on whichever subnet has the greatest number of hosts, even if most of subnets have far fewer. This is inefficient even in small networks, and can result in the need to use extra addressing blocks while wasting many of the addresses in each block. For example, consider a relatively small company with a Class C network, 201.45.222.0/24. They have six subnetworks in their network. The first four subnets (S1, S2, S3 and S4) are relatively small, containing only 10 hosts each. However, one of them (S5) is for their production floor and has 50 hosts, and the last (S6) is their development and engineering group, which has 100 hosts. The total number of hosts needed is thus 196. Without subnetting, we have enough hosts in our Class C network to handle them all. However, when we try to subnet, we have a big problem. In order to have six subnets we need to use 3 bits for the subnet ID. 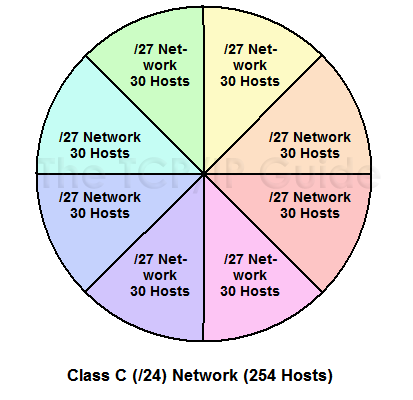 This leaves only 5 bits for the host ID, which means every subnet has the identical capacity of 30 hosts, as shown in Figure 70. This is enough for the smaller subnets but not enough for the larger ones. The only solution with conventional subnetting, other than shuffling the physical subnets, is to get another Class C block for the two big subnets and use the original for the four small ones. But this is expensive, and means wasting hundreds of IP addresses! With traditional subnetting, all subnets must be the same size, which creates problems when there are some subnets that are much larger than others. Contrast to Figure 71.